StayTuned Auto Repair Ltd. is a fully licensed automotive repair facility that has earned the trust of thousands of satisfied customers. Located on the North Shore of Kamloops, we serve the entire city and have many customers from throughout the interior of B.C. We are a small personalized shop that prides itself in getting the job done right. We specialize in air conditoning systems, tune-ups, electrical systems, brakes and steering. If your car needs repair then we are the people to see. 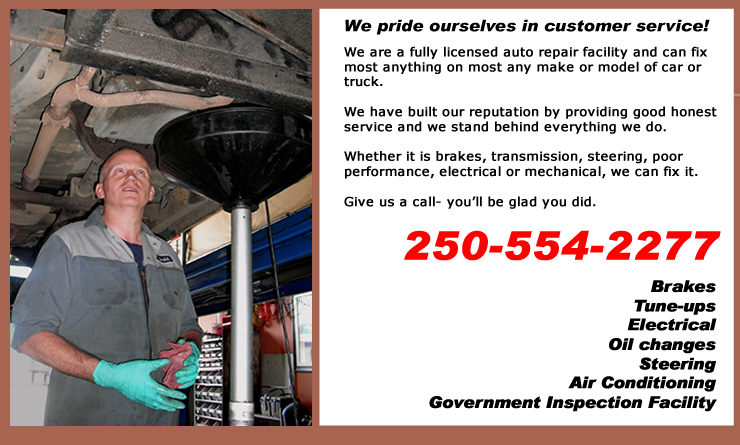 Also, as a fully licensed government inspection facility, we can handle all of your inspection needs. And, as licensed air conditioner technicians we can check, service and/or repair your system to ensure trouble free driving all summer long. We are located at #8 - 1121 12th St., North Shore, Kamloops, B.C.